As promised, here are all the lovely goodies that I received from the 4 secret santas that I participated in this year. I count myself very lucky as each of my santas were quite generous and put a lot of thought and care into each package. Thank you to all the lovely ladies that sent to me! I have a few exciting book mail things to share from late October and yesterday! I’m super thrilled about all of it. Here’s the October package my secret sister sent. So many wonderful Halloween goodies. Loving that Halloween fairy/witch art! At the end of last week, I received a fabulous September secret sister package featuring a childhood favorite movie and a full-color manga that has Marie from The Aristocats 🙂 My secret sister is hitting it out of the park, and this is only the second month! It also reminded me that I haven’t done a book haul post in many weeks, so here’s all the goodies I’ve received from various places. It’s been awhile again since I’ve shared the goodies that I’ve picked up. Here’s my last OTSP Secret Sister package from last round from my “sister” Crystal 🙂 She very much so spoiled me with all these hot chocolate flavors and adorable eeveelution bookmarks that she made! And I’m excited to get caught up with this series as this is the final book. Next up is some trades and my first granted bookish wish. I love The Testing and wish Netflix or someone would make a movie or series out of this one! The top row of the first pic and the following pic are all from work over the last month or so. I’m really excited to read like all of them! Then the second row includes 2 bookish wishes, a trade, and an art print that I paid for. Thanks everyone! Last week was an awesome week for book mail! I was going to post this overview on Saturday when my Book Outlet order arrived. Except, well, my Book Outlet order didn’t arrive. So then I didn’t really feel like talking about books when I was worried about my books that were stuck in a different city. But I’m all geared up and exhilarated again, so I’d like to share all the awesome that did arrive last week!! My last OTSPSecretSister of the round came and super brightened my day! I have had so much fun sending and receiving cheer 🙂 This month’s theme was purple and it was perfect. I’ve listened to some of the Nightvale podcast and was excited when a book came out. Tricks for Free is a signed arc in the InCryptid series. The caramel corn is a local specialty. Who doesn’t need a giant hashtag eraser? And I’m excited to try the colourpop lippie stick. I’ve never had one before and rarely wear lipstick, but yay! I’ve been eagerly waiting for the sequel to Peadar O’Guilin’s The Call, so when The Invasion showed up at work, I had to snap it up! RWBY Vol. 1 is the result of a trade. Cast in Deception and The Bones of the Earth were also results of recent trades. The last thing I want to share was the preorder incentive from The Cruel Prince. That pin is gorgeous and hurray for author signatures! This cover really grabbed my attention when it was first released, but I didn’t get around to picking it up until my Secret Sister sent it in my October box. I read it the week of Halloween, which was perfect timing with the spooky mystery and setting. I had the absolute pleasure of participating in a couple of secret santas arranged through Twitter. I was new to all of them, and I loved being able to search for little fun gifts and wishlist books for people I didn’t really know. It was a lot of fun, and I plan to participate again next year if they happen and I have the finances available! I just want to take the time to thank the wonderful people who organized these exchanges and the generous people who contributed to my Christmas joy this year! My secret sister is on point and always seems to get the month’s package out right at the beginning, so I don’t have long to wait! October’s theme was Halloween/spooky and included 2 books! and an iZombie Funko Pop for my amazing ladies collection. The first thing I did after opening this package was spend three hours excavating that tombstone, I found the tiny black skull hidden inside within the first hour. But that tombstone was huge and I wasn’t sure if there was supposed to be any more. Unfortunately, I did bruise my hand and typing at work the next couple days was quite interesting. 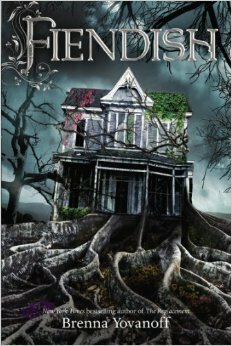 I did read Fiendish last month as my spooky Halloween read and should be sharing my review very soon! Such as fun package, thanks secret sister. Sadly, this means that there are only 2 more months for this round and then I’ll have to decide whether I can participate in the next round. I really hope that I can as this has been such an amazing experience so far.